Summer has been really busy and I haven’t had the chance to post cards, though I’ve made several. Today I pushed myself to do a post. This is a card I made for Ellen Hutson’s classroom July, 2016 Mix It Up Challenge. The challenge requires that you use stamps or products from Essentials by Ellen and Neat & Tangled. I decided to go with a CAS style card. I chose images with strong graphic lines from both brands that I think go well together. 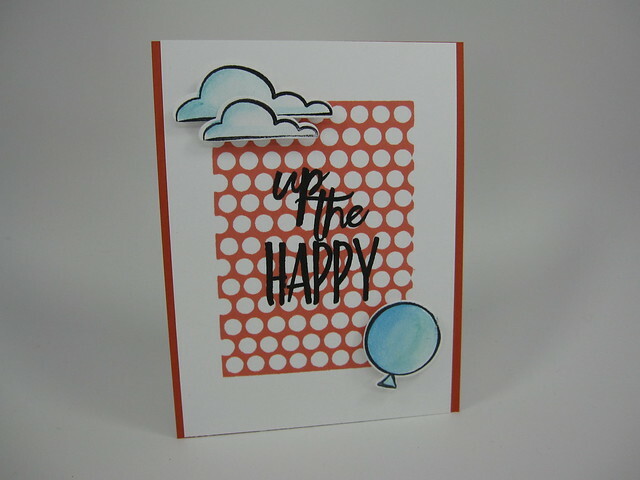 The clouds and balloon where colored with watercolor coloring pencils and then die-cut and then popped-up on the card front using dimensional foam dots. All other images were stamped directly onto the card front. I love Neat & Tangled’s products. They have a very graphic feel to them and they’ve just recently added cute critters (Kitty’s Favorite Things) and other whimsical images such as a mermaid (Mermazing). I remember buying my first sets (Little Tangles and On the Strip) from them before they were ever sold by online stamp stores such as Ellen Hutson and Simon Says Stamp. The N&T Punchinella stamp is one that looks great in bold colors or on tone-on-tone. N&T even has a Punchinella die! Have an outstanding and happy day! Stamps: Essentials by Ellen: Up the Happy (clouds and balloon); Neat & Tangled: Punchinella stamp (background). Dies: Essentials by Ellen: coordinating dies to the Up the Happy stamp set. Inks and other Coloring Mediums: WPlus9: Flamingo (background); Versafine: Black Onyx (cloud and balloon images and sentiment); Staedtler watercolor pencils (coloring for clouds and balloon). 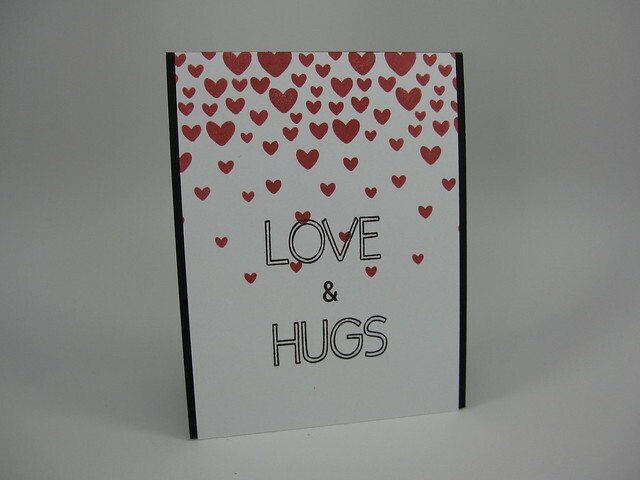 Cardstock: Neenah Solar White 80# card front; Coral colored card stock from my stash for card front mat; Neenah Solar White 110# for card base.